The menu bar of OS X has two default color choices, simple grey, or translucent, which varies a bit based upon the wallpaper used. Neither of these looks are really anything to write home about. That’s why the third party mod ObsidianMenuBar is a nice alternative, it gives your Mac a black menu bar. It’s not perfect, but it still looks absolutely fantastic, and really, this is the menu bar that OS X should have. ObsidianMenuBar is free, easy to install, and just as easy to reverse if you decide you don’t like it. Because this modifies some system files and is unsupported by the developer, you’ll probably want to backup your Mac before trying it out. 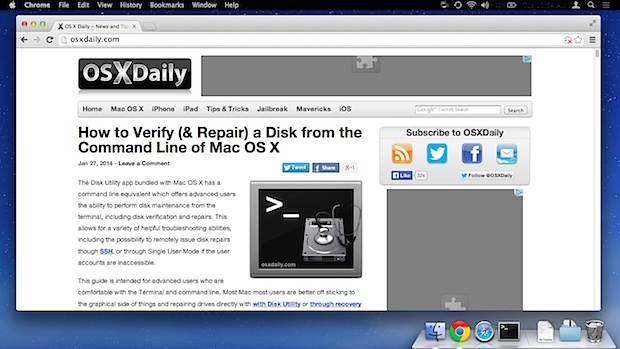 You’ll immediately see the difference, the Mac menu bar is suddenly much more attractive. 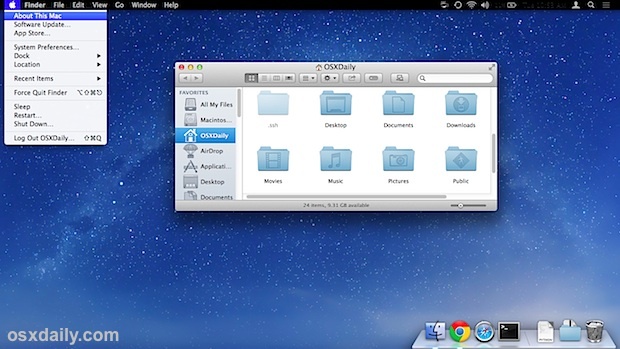 It looks mostly fine throughout OS X, in the Finder, and in third party apps. No, it’s not perfect, and there are some quirks with how certain menu bar elements look, but if you don’t mind the clock (the emoji clock stays looking good) and battery percentage being mostly invisible you probably won’t be overly bothered by those menu items with low contrast. Installing the optional WhiteUIServer addition helps, but some third party menu bar items are a lost cause for now. Black menu bars are nothing new, so why bother with Obsidian? Well other than the obvious attractiveness, it’s also the only way to get a black menu bar in the newest versions of OS X. The old tricks of going black with the Nocturne app or MenuBarFilter haven’t been updated in a while and they don’t work with OS X Mavericks at all, yes you can modify them, but they wind up being buggy and probably not worth it. MenuBarFilter is generally my preferred choice for it’s simplicity, but until it gets updated for Mavericks, it’s looking like Obsidian is the way to go. Finally, if you used the translucent menu bar before, head back to System Preferences and re-enable it. I’d rather the menu bar be completely invisible like iOS 7. What I don’t understand is why developers leave very simple things such as this out of the core OS. I’m not a programmer but I really don’t think this would be too much to include. This app just trashed my rMBP with mavericks. Grey screen of death. Now spending 11 hrs reinstalling everything from time capsule. What a waste. It provides more options, and I’ve not had any trouble with it in Mavericks. Any update coming for 10.9.1? I accidentally updated my mac osx to 10.9.1 and I want to remove the theme but it keeps giving me an error and it’s stopping me from doing so, help? Grey bar is just fine. Tried it for about 20 mins, looks cool, but sorta distracting. I agree, grey bar is the best. After installing this app I got a lot of OS X errors messages. This messages was not from this app itself, but from the system. Obsidian was immediately uninstalled, but it doesn’t help. Looks like now I need reinstall whole OS X (- _ – ). That’s what you get when developer terms told you “use at your own risk”. MacBook Pro 13″ 2013, Mavericks. That’s a throwback! That’s what the Apple OS (didn’t even have a number yet) had on the Lisa. Even before the Mac! hi upgraded to yosimite and wen I tried to delete or restore back from obsidian, it shows that it only works for maveriks. Does upgrading to yosimite, uninstall the obsidian?